Since we’ve started taking non-theatrical bookings on the The Imposter, we’ve been receiving some great feedback from film societies and clubs, whose audiences have responded strongly to the film. To give us a sense of the experience, we invited Phoenix Fry, of recent nominees at the BFFS awards, the Deptford Film Club, to tell us about their screening and the atmosphere of their events. First of all, the name Deptford Film Club is a lie. Its not a club; anyone can turn up and watch the feature films we show every fortnight. Also were not in Deptford, but just over the border in New Cross, an area of south east London that vibrates with the A2s constant stream of lorries carrying goods from Kentish ports into central London. 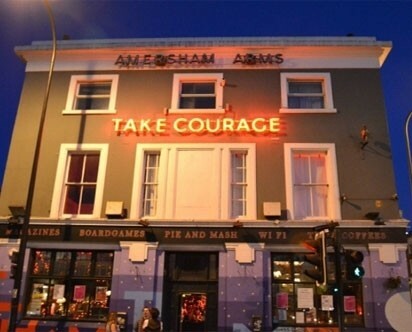 Its Wednesday night, and people walk through the Amersham Arms and take a narrow staircase up to the room where were screening The Imposter. The lighting is low, and American-diner-style banquettes have been shifted to face a blank wall. The room is packed. Pints of beer are set down, mobile phones clicked onto silent, and we thirty or so people are, for 99 minutes, immersed in the world of this compelling British documentary. We’ve been doing Deptford Film Club for nearly three years now, and we know which films work well in this space. The room is not a sealed box; the glow of streetlights outside peeps through the window blinds, and the soundtrack of the films is complemented by muffled sounds of the pub below and the shrill sirens of ambulances and police pelting toward emergencies. It adds an edge to the film club screenings. Some movies just don’t work here. The Imposter works amazingly. The mystery of the film is not in what happens. Like the confession opening of Double Indemnity, this documentary begins at the end: Frenchman Frederic Bourdin faces the camera and explains how he pretended to be Nicholas Gibson, a Texan teenager who had vanished from his home three and a half years earlier. After Bourdin tells the police he’d been kidnapped and sexually abused, he is welcomed home by Nicholas distraught family. Here’s the mystery, then. Why did he do it? And why do the family not seem to notice that he speaks English with a French accent, and has brown eyes and dark hair – not Nicholas’s blue eyes and blond hair? And this mystery is as gripping as hell. Halfway through, we stop the film for 15 minutes so the audience can grab a drink or a smoke, and go to the toilet. And they’re already raving about the film. Why are film clubs better than cinemas, and better than watching a movie at home? It’s because you can be swallowed by a film, and yet be able to turn to someone (probably a stranger, or maybe that attractive person you saw here last week) and talk through your reaction to the experience. It doesn’t feel pretentious or awkward. There’s none of that worry about whether you can sneak out before the Q&A. You just feel yourself quite naturally, quite casually, reacting to the film in a public place. The second half ends and there’s a magical moment where we all sit in the dark together as the credits roll. The lights come back on, but the moment continues: that feeling of being both in the film and in the room. We used to encourage people to clap at the end of screenings, but there’s something nicer about waking up from a film slowly. The talking begins again, and the questions, and the big smiles. It was brilliant, amazing. It is such a fantastically-made film. I want to write that they said chilling and unsettling and ‘the best documentary I’ve seen this year’, but that’s me just making things up. But it was. It really was. Phoenix Fry is the creative coordinator of Deptford Film Club and Sydenham Film Club, and co-producer of the New Cross + Deptford Free Film Festival. In 2010 he produced the UK’s first festival dedicated to Nollywood (Nigeria’s hugely prolific film industry), and is still very excited about international populist cinema. He currently lectures at University of the Arts London.